Law Prof Glenn Reynolds, aka Instapundit, has a policy proposal for President Obama in the Wall St. Journal: lowering the drinking age to 18. Barack Obama today told war veterans he won't lower the drinking age. Army veteran Ernest Johnson, 23, of Connecticut, said one of the things that peeved him before he turned 21 was that he couldn't come home and drink a beer _ even though he was old enough to serve in the armed services and die for his country. As I noted here, more states are considering lowering the drinking age. Sounds like Obama has fallen for the myths about underage drinking. The Chicago Tribune today reports that more states are considering lowering the drinking age to 18 or 19. Discussions have been taking place in Vermont, New Hampshire, Missouri, South Carolina and Wisconsin. 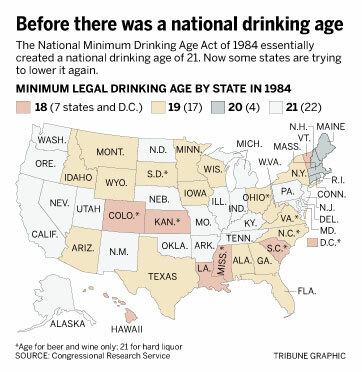 Here's a graphic of where the states stood in 1984 before the feds passed a law requiring the age to be 21. When I turned 18 (in New York)the drinking age was 18. It seemed ridiculous to me that the states raised it. Here's more. What do you think? Take our poll below.